Gladiators needed 25 off the last 6...They got 23! 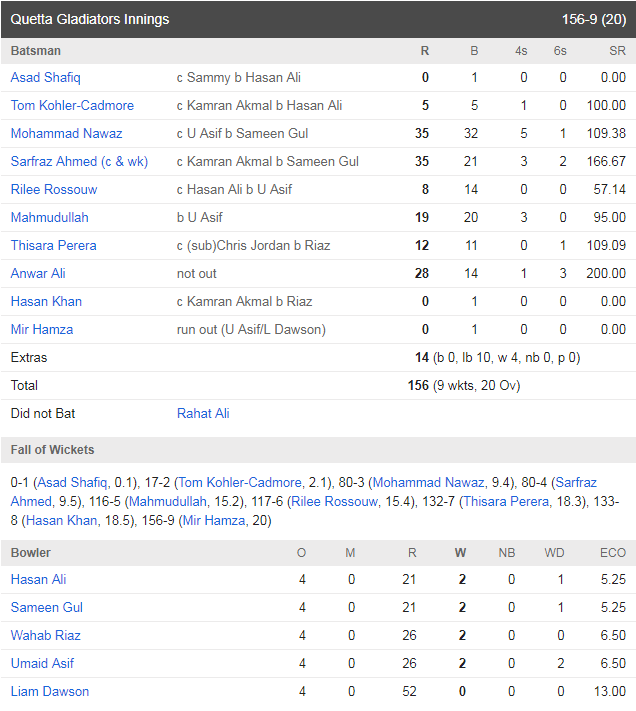 #YellowStorm prevails in Lahore and just by 1 run. 50 comes up for Quetta Gladiators! Sameen Gul to Mohammad Nawaz, SIX! Mahmudullah to Liam Dawson, SIX! 50 comes up for Peshawar Zalmi! Hasan Khan to Hafeez, SIX! Mir Hamza to Andre Fletcher, OUT, Caught by Perera!! Wow! Thisara, take a bow. 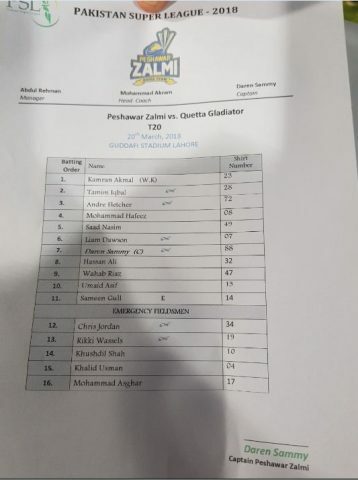 Quetta Gladiators have won the toss and elected to bowl first against Peshawar Zalmi. Sarfraz Ahmed: "Our two key players are out but we will try to do well in the all important game. We are very excited." Darren Sammy: "We would have loved to bowl first. But we are ready to bat first. We will have to play according to the situation." The toss is expected shortly. Covers are off as rain has stopped. Large numbers of spectators have reached the ground to watch the game. 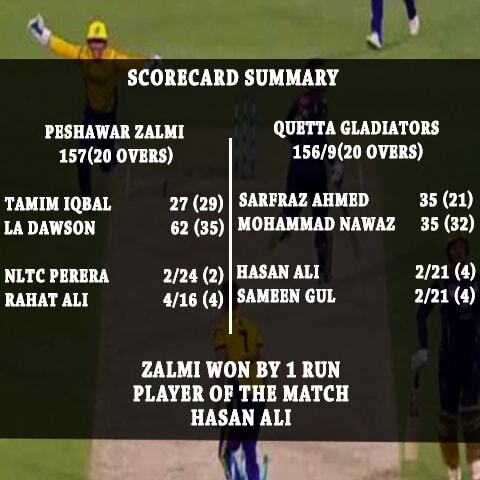 Hello and welcome to the ball-by-ball coverage of first Eliminator being played between Peshawar Zalmi and Quetta Gladiators at Gaddafi Cricket Stadium in Lahore. 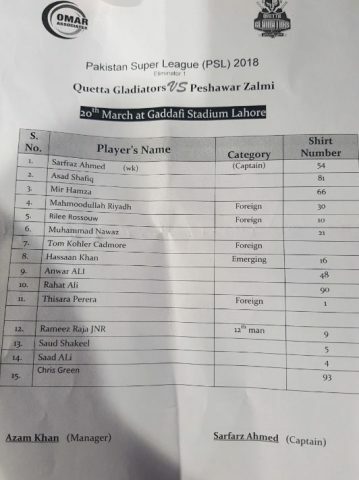 LAHORE: The first eliminator of Pakistan Super League 2018 will be played between Peshawar Zalmi and Quetta Gladiators at Lahore's iconic Gaddafi Stadium on Tuesday. The winner of the match will go on to play against Karachi Kings in the second eliminator on March 21. The loser will be knocked out of the tournament. Karachi Kings, who finished second in the round-robin stage, suffered an eight-wicket loss at the hands of Islamabad United in the qualifier. Islamabad United qualified for the final of this year's edition as a result. All the tickets for the match have been sold out. Strict security measures have been taken to ensure no untoward incident takes place during the match. Contingents of law enforcement agencies and security teams have been deployed inside and outside the stadium. Lahore's National Hockey Stadium has been turned into a 20,000 bed hospital. The match will start at 7:00pm.